Flawless recognition of stamps cannot be guaranteed. Whenever StampScan fails to divide the scanned image properly, you can still rely on manual clipping and deskewing. Click the "Add Stamp" button and draw the diagonal of the desired rectangle over the scanned image area. You can adjust the rotation afterwards - the new stamp will always be oriented straight. 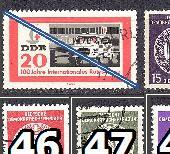 Manual stamp highlighting can also be initiated with the INSERT button when working in the "Scanned Image" panel. The process is the same, just draw the diagonal and then finetune the frame's alignment to fit the stamp.